Forget the Red Hat clubs and the “When I Am An Old Woman I Will Wear Purple.” When I declare I am old I will wear chocolate pearls. Alice looks at me expectantly like this proclamation might bring food? She queries me, “Is there something in this for me! (besides my tireless search of threats to our peace in the form of gray squirrels? )” I dig out her crusty ears, apologising profusely for the indignity, count myself lucky that she is docile and doesn’t threaten to rip my arm off. Such is the glamorous life I lead. Ah the daily rituals of being over half a century. I am counting down the weeks to 60 years on this earth and there are certain truths I have begun to accept. The love of a dog is like no other, a night out with a girlfriend, (who may be slightly behind me in years) is good for the soul and reaffirms my belief that there is life after stages such as hands-on motherhood and marriage. I would also included the belief that the next generation we brought into being, will carry on this simple goodness. The goddesses and gods we have created will take on the mantle. As to the choice of jewelry? What is more elegant and satisfying than chocolate or pearls? The marriage of the two. Rather than wear purple or a red hat, rather than join a society, I choose to follow the current path and wear chocolate pearls as my badge for making it through sixty years of learning. This entry was posted in inspiration. Tagged aging, inspriation, life after 59, memoir, mortality, New Hampshire. Thanks Doppleganger. You know I never followed the crowd! 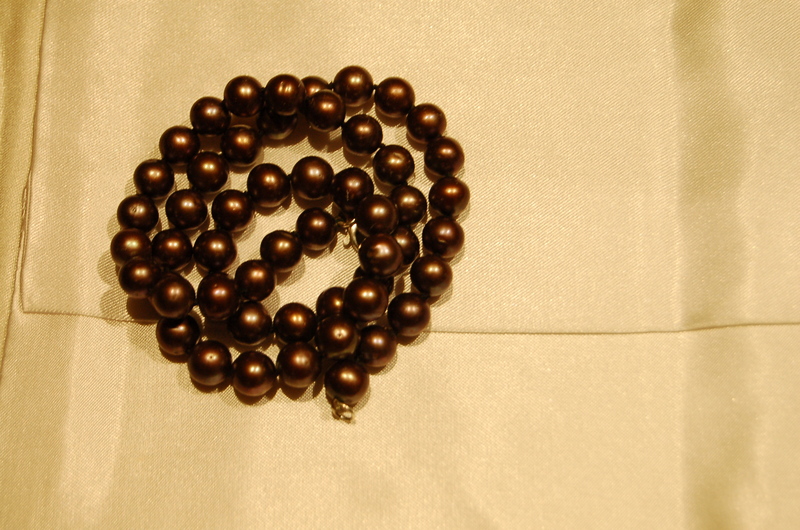 Maybe you need some chocolate pearls for your birthday?? We could start a whole new trend! We have always been trend setters, you and I… scary some times, but trend setters none the less! Who else could pull off mini kilt skirts, knee high socks and platform sandals in the middle of winter in NH? like I said… scary! Now our secret is out and the whole world will be wearing our signature outfit! !